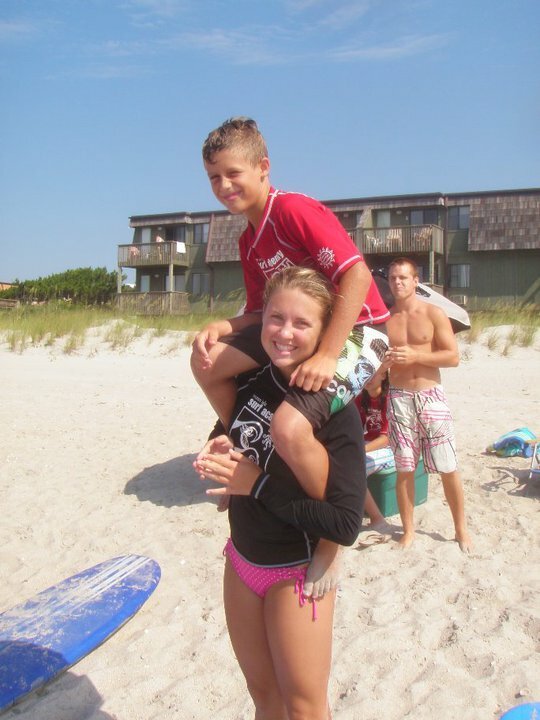 Surf Camps are offered on a weekly basis. Camps run Monday through Thursday from 8:30am until 11:00 am. Friday is reserved as a make up day for poor conditions. 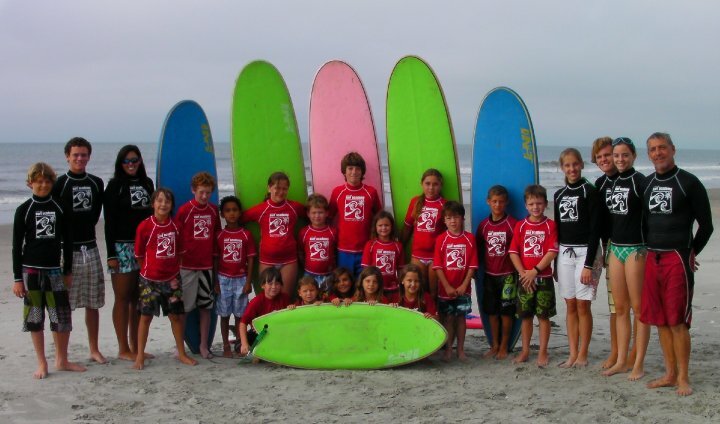 Day Surf Camp is offered to ages 10 and up, as well as Little Kids Surf Camp for ages 6-9. Camps are held at Beaufort Street (West end water tower). 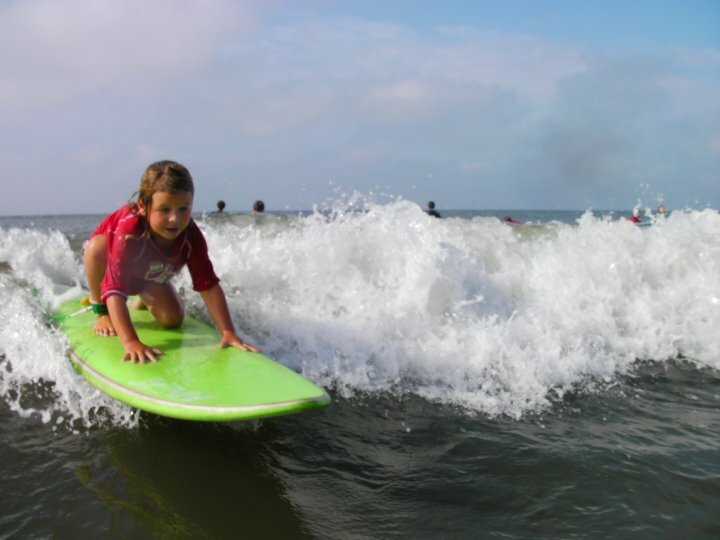 Our Little Kids Surf Camp offers a fun filled introduction to surfing and ocean safety. We focus on teaching the kids to react properly to ocean currents, waves, and how to read the ocean. Don't worry, if they are a bit tenative we will ease them into the water as their comfort level allows! The student to instructor ratio is 1 to 1 (avid swimmers may be paired 2 students to 1 instructor). All participants are swim tested before we begin surfing to determine how they manage themselves in the ocean. 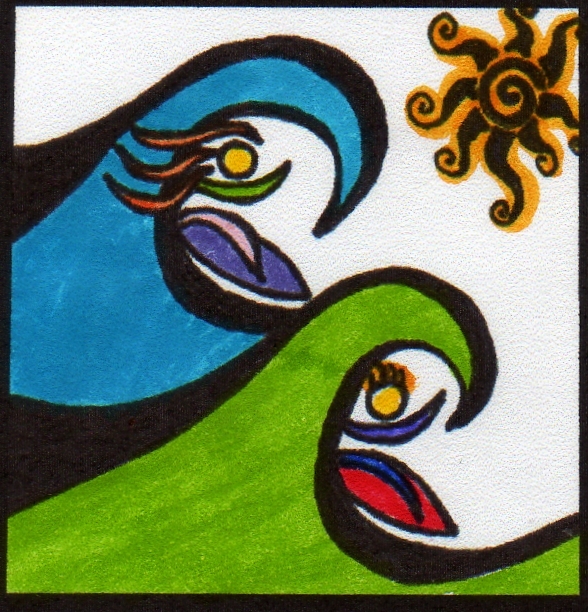 Don't fear, we teach in waist deep and shallower water, inside the breaking waves. Our instructors are very experienced , and stabilize the surfboard while pushing the kids into white water waves which allows them to stand more easily without frustration! Surf camp surfboards are made of soft foam, the same material as a boogie board, with a plastic bottom and flexible fins (much safer and forgiving than ordinary fiberglass boards). If ocean conditions are too rough we swim, boogie board, and play games on the beach- safety comes first!! We have certified lifeguards, and instructors trained in CPR and first aid. After camp, your child will be more confident in the ocean, and demonstrate a basic knowledge of ocean currents and how to properly react to them in the future! 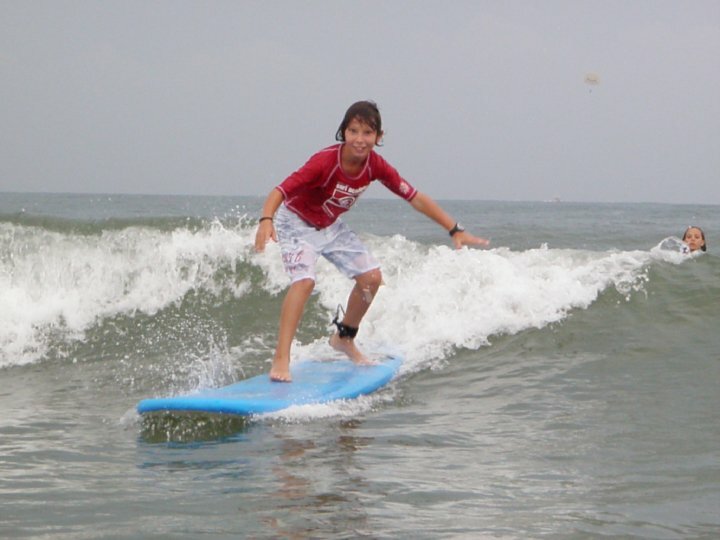 Day surf Camp is a fun filled surfing experience for older kids. We swim test everyone before going into the water to surf. Campers are grouped 2 to 3 per instructor depending on experience and skill level. 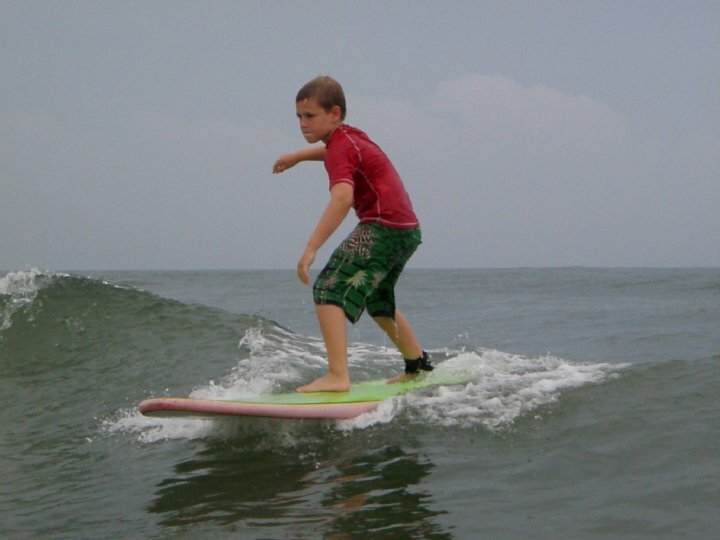 The first day of camp we focus on board handling skills, posisitoning, pop-ups, and proper stance on the surfboard. 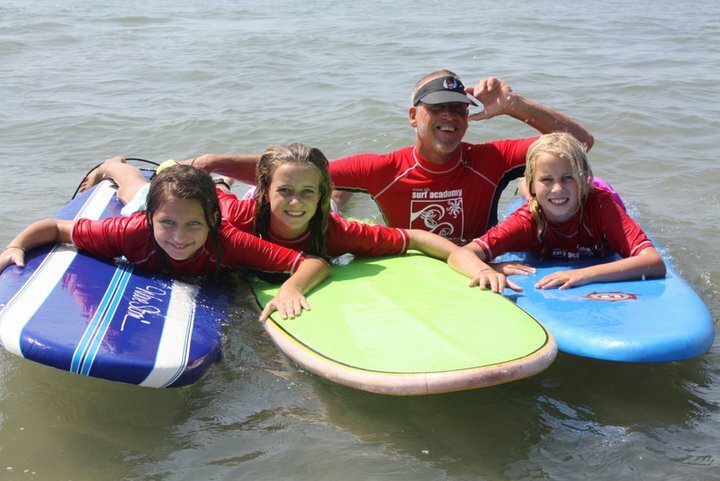 Instructors help campers with their boards into the water and push them into waves while stabilizing the surfboard making it easier to stand up and surf! Every day the campers learn a bit more and we assist them less in the water , and by the end of the week they are catching their own waves and surfing independently. More experienced campers are taken out in groups of 3 per instructor to fine tune their skills by improving wave reading, going down the line, learning turns, cut-backs, floaters, etc.